Located in the heart of Truro, we've been serving customers from Penzance to Portscatho for over 40 years. Which means our family-run business can use their experience to provide our customers with exactly what they want and enjoy. We continue with our traditions, using our signature home-made recipe batter which has become justly famous. We also take conservation seriously and all our beautiful cod comes from sustainable sources in Russian, Norwegian and Icelandic waters. 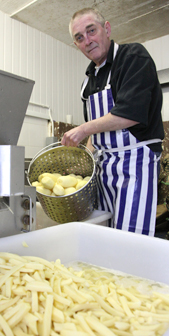 Right: Head Fryer David Palmer. QUALITY AWARDS 'Scores on Doors' is the new Government scheme which gives consumers a quick way of checking the food and premises cleanliness rating. You'll see ours in the front window of SOLE PLAICE. We are proud of our top score, 5 out of 5, and work hard to maintain the very top standards. Founded in 1913, this longstanding body recognises a combination of qualities only found in top Fish and Chip Takeaways and resturants in the UK. We are delighted to have received this prestigious award which recognises our professional business, friendly staff and rigorous standards of cleanliness. Our community is very important to us. Blessed with living and working in such a beautiful part of the world we consider ourselves lucky, and aim to give something back to people less fortunate than ourselves.So, every year we organise an annual fund raiser to support a designated charity. 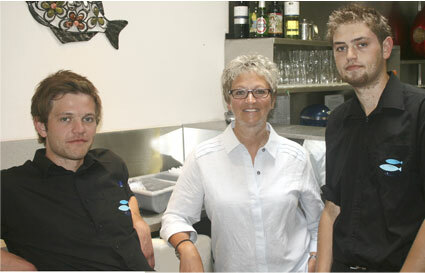 Above: Staff at Sole Plaice enjoy what they do so you can always count on friendly faces and the best service here. Living and trading in Cornwall SOLE PLAICE has access to some of the most top quality products in the country-enjoy sparkling cider, savour spicy chutneys and mouth-watering sauces - just some of the delicious additions for your favourite traditional fish and chips! Cornish Cyder Farm - produces a range of apple juice and cyder. Our favourite is Rattler, their thirst-quenching premium session cyder. St Austell, our 100% pure beefburgers have received many compliments, don't forget to check out our interestingly varied menu! their clients. We're confident they supply us with the very best. In addition to using the best of Cornish produce we always provide sauces from top brand companies like Heinz, HP and Hellmanns.